The flag of Elaziğ (photo) is white with the municipality's emblem. The former flag of Elaziğ (photo) was white with a very similar emblem. "Belediyesi" means "Municipality". The municipality of Akçakiraz (6,508 inhabitants in 2013) is located 15 km south of Elazığ. The flag of Akçakiraz (photo, photo) is white with the municipality's emblem. "Belediyesi" means "Municipality". 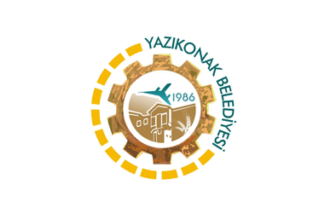 The flag of Yazıkonak (photo) is white with the municipality's emblem. "Belediyesi" means "Municipality". FÜ (website), established on 11 April 1975 in Elazığ, is composed of 13 Faculties, 3 Vocational Schools and 4 Institutes. The flag of FÜ (photo, photo, photo, photo, photo, photo, photo, photo, photo) is white with the university's emblem. On the flag, the lettering around the graphical element of the emblem is dark red instead of black, as it is on the stand-alone emblem. 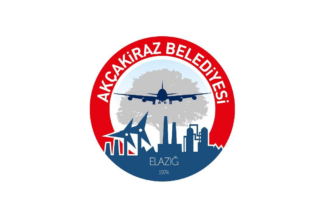 The flag of the Elaziğ Chamber of Commerce and Industry (photo, photo, photo, photo, photo, photo, photo) is white with the organization's logo.